Natural bacterial suppressant for Blanket Weed (String Algae) and Green Water (Single-celled Algae). Viresco is also effective at breaking down organic pond floor matter. Treats up to 70,000 litres (15,500 Gallons) of pond or lake water. Viresco treatment will also promote resistance to fish disease and can be used on small ponds or larger lake waters. Note: Needs sufficient supply of oxygen to enable effective & prolonged growth of bacteria and to protect fish stock. Please view our pond & Lake Aerators for suitable oxygenators, if required. Controlling Algae in Ponds & Lakes. The presence of algae in ponds and lakes need not necessarily cause a problem. However, in many cases it does and it is advisable to remove it. 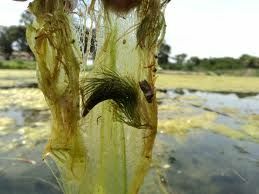 Suspended single-celled algae (creating pea green water) can block sunlight from reaching the pond or lake inhabitants and will also absorb vital oxygen from the water body. Filamentous Algae (also known as Blanketweed or String Algae) can look very unsightly and may also block pumps and other technology whilst placing stress on the oxygen levels. If left unchecked, algae will also create a pungent smell. Single-celled planktonic algae can be controlled in garden ponds by installing an Ultra Violet Filter. The UV light is very effective in agglomerating these single celled algae into clumps that then can be “caught” in the physical filter system attached to the pond. 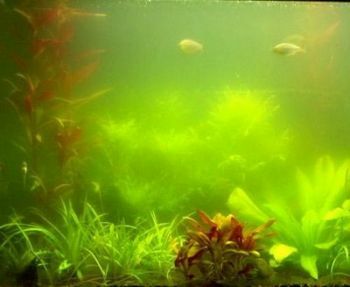 However, UV filter lights have no effect on filamentous or macrophytic algae and other control methods have to be used. These methods include the use of chemicals and microbial products. Many pond keepers prefer not to use chemical methods. Our VAqua natural microbial water treatments will reduce and remove the nutrients, notably nitrate and phosphate, on which all algae feed. Planktonic, filamentous and macrophytic algae thus die of starvation. Water Garden can provide effective biological water treatments for pond and lakes of virtually any size and depth. Ideally, VAqua treatments should be used together with sufficient water circulation and aeration to aid the breeding process of the bacteria. Aeration will also help to promote the growth of naturally occuring bacteria. View Lake Aeration Systems here. These are single-celled microscopic plants that float freely in pond water. When planktonic algae are very abundant, they make the water turn green. This is known as an algal “bloom”. More infrequently, the colour of the water can be turned into other colours, e.g. yellow, brown or red.